Standing in the middle of Akihabara, aluminum bat in hand and surrounded by the recently liberated garments of my fallen enemies, I watch as a small army of vampire-like creatures melt away under the harsh rays of a shining sun. Akiba’s Trip: Undead & Undressed is a game that certainly lives up to its title, and it’s available now for the PlayStation 3 and PlayStation Vita. For the uninitiated, Akihabara (Akiba for short) has become a refuge for otaku culture in Japan. Also known as Tokyo’s Electric Town, the blocks known as Akiba are utterly stuffed with shops and restaurants dedicated to nerd culture. From manga and video games to collectables, electronics and more; If it’s even remotely geeky, you can probably find it in Akiba. 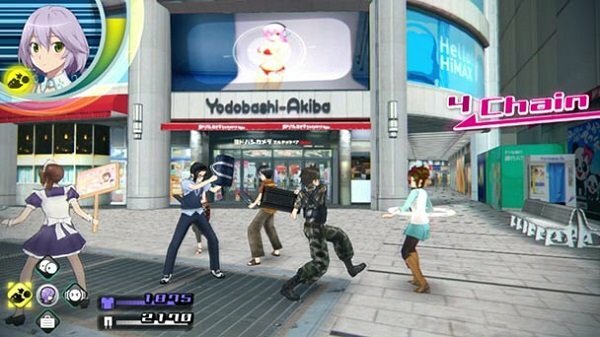 In Akiba’s Trip: Undead & Undressed, this legendary district will become your second home thanks to the folks at XSEED Games. As the lead character, you find yourself in a pretty bizarre situation. You’ve heard all sorts of rumors of these vampire-like creatures feeding on the energy of Akiba visitors, but you never thought in a million years that you would become one of them yourself. Unfortunately, your greed for rare collectibles led you to blindly taking part in some questionable “medical research” and, wouldn’t you know it, you’ve now been turned into one of these super-human leeches, better known as Synthisters. You’re a pretty good guy, on the whole, so you’re not exactly willing to join the Synthister cause and feed on the innocent. Luckily, your initiation into the group is interrupted by one Shizuku Tokikaze, a mysterious young woman working to overthrow the Synthisters who decides to adopt you to her cause. From there, Shizuki joins you and your friends, a rag-tag group of youngsters who make it their sworn duty to protect Akiba and serve its visitors. Up until this point, Akiba’s Trip is basically par for the course when it comes to action JRPGs. Then the clothes start coming off…Literally. One of the main aspects that sets Akiba’s Trip apart from the pack is its fighting mechanics. For starters, your arsenal is limited, but varied enough to offer some decent strategy. Your strikes are limited to high, medium and low blows, each of which does damage to a piece of gear being worn by your enemy. You can also jump, guard, perform a carefully timed counter or even wind up for a big hit if your enemy won’t stop blocking. Do enough damage, though, and it’s time to make with the stripping. It turns out that these vampiric Synthisters, while not bothered by crosses or garlic, are still vulnerable to sunlight, and the best way to send them to the underworld is to remove all of their outer wear, leaving them to burn away in the sunlight wearing nothing but their underoos. Holding the appropriate attack button will let you yank off their damaged attire and, assuming they or another nearby opponent have on more damaged gear, you can then begin a fast and frantic stripping chain that lets you combo your way into Underwear Town. To augment your combat, you’ll have access to a huge range of makeshift weapons spread across a handful of classes, including everything from boxing gloves and umbrellas to rolled up posters, keyboards and guitars. These, as well as the equally varied bits of clothing you can equip your character with, can be sold or synthesized by your adorable kid sister to make even better gear. And you’ll definitely want better gear, because your clothes are susceptible to grabby hands, too, and your body is just as vulnerable to sunlight. When you’re not following the main storyline, you’ll be able to spend your time exploring the highly detailed recreation of Akihabara, visiting loads of shops and picking up actual flyers/advertisements that you can peruse at your leisure. Ads from other Acquire games and various bits of TV programming also streams in the background, along with music, crowd chatter, etc. Akiba is one of those rare settings that actually becomes like its own character in the game, the only problem being that its various bits and pieces are broken up into small chunks that require constant loading between scenes. A fully open city would have been ideal here, but at least there’s a fast travel option to help cut down on the hassle. Optional side missions are available, which all basically boil down to taking photos, fighting loads of baddies and running errands. You can also chat up your NPC friends, play an arcade mini-game or hunt down stray Synthisters wearing gear you might want to add to you collection. Your smartphone serves as your constant link to the various bits of the game world, including a ridiculously complete Encyclopedia, a To-Do list to remind you what your various mission objectives are and more. There’s also an email account that, along with helping progress main story missions, give you little updates on your side missions and the like. And then there’s the Twitter parody, called Pitter, where a group of extremely distinct Akiba regulars discuss the various goings on of the district. This proves to be an interesting and entertaining way of fleshing out the game’s narrative, as well as making it feel like you’re adventuring through a living, breathing city. Which brings me to the game’s writing. There’s a lot being said in Akiba’s Trip, whether in a cutscene or nestled in one of your many smartphone apps, the vast majority of which kept a smile on my face throughout the game. Along with a lot of tongue-in-cheek humor and clever references, the discussions and descriptions (especially on Pitter) are actually fun to read, which is in and of itself uncommon in many RPGs. Also, there’s plenty of replay value to be found here. Each time you dive into a New Game +, your gear and weapons carry over from the previous game while your stats and pretty much everything else resets. You’ll also unlock a new difficulty mode, as well as extra goodies depending on whether or not you met various requirements. There are also four love interests within the game and, depending on your dialogue choices and how much time you spend with them, you’ll earn different endings accordingly. That’s another interesting thing about Akiba’s Trip. The game is, in many ways, a satire that dissects and pokes a little good-natured fun at the otaku lifestyle. At the same time, though, it’s a celebration of all of those things that make nerdhood so great. There are loads of collectibles, message boards that are home to a wide array of goofy characters, a harem romance, the ability to play dress up and, yes, lots and lots of fan service. There’s also the ability to explore a close-to-real-life representation of an otaku paradise, which would be pretty rad no matter what type of game you’re playing. While the game structure, narrative and combat are relatively light (and let’s not forget about those constant loads and a camera that sometimes needs to be wrestled into submission), all of these extra shiny bits help make Akiba’s Trip a complete package. I suppose I would be remiss in my duties as a reviewer if I did not touch on the stripping mechanic, too. When I first heard about this aspect of the game, I was initially turned off. I wanted no part in a game that, at first blush, looked like a simple sexual harassment simulator. 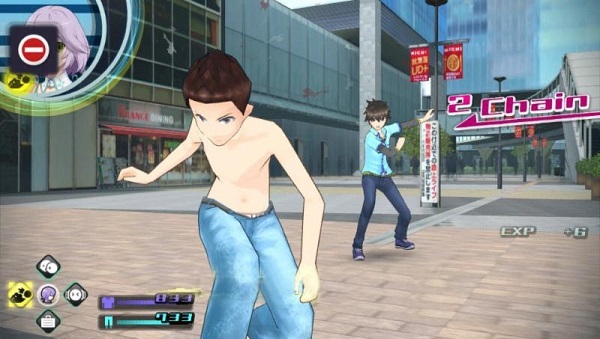 But to write Akiba’s Strip off as such an experience would not be doing the game justice. For starters, this is an equal opportunity stripper, for lack of a better term, so you’ll be pulling the clothes off of men and women alike (though I’d guess that the ratio is somewhere around two or three guys to every one gal stripped). Yes, there are jiggle physics and people running around in their underwear, but the game’s atmosphere, negative reactions from NPCs to pervy dialogue choices and cartoon antics make this kind of fan service difficult to take seriously. It’s silly, mostly tasteless humor that never feels ill-intentioned. Akiba’s Trip did prove to be something of a slow burn for me, not fully clicking until about halfway through the main campaign. By then, I had gotten used to the flow of the game, its various mechanics, the city itself and the subtle depth to its combat. Once the whole picture started to come into focus, I found myself having a lot more fun. It’s also helpful that Akiba and the culture it embodies is pretty much directly in my wheelhouse, so 90 percent of what was happening or being said in the game spoke directly to me. I wouldn’t fault anyone from shying away from Akiba’s Trip. There’s nothing else like it on the market and, let’s face it, even the silly antics and playful approach to the adult themes still boils down to a game where you’re ripping the clothes off of people. If you can get past the blush-worthy moments and are a fan of all things otaku, though, then Akiba’s Trip: Undead & Undressed is definitely worth a visit on the PS3 and Vita. If, however, you can wait until this winter, then XSEED has announced that you’ll also be able to get your hands on Akiba’s Trip for the PlayStation 4.